Anybody else turned off by the consumerism that has overtaken Christmas? The last couple of years I have made a conscious effort to slow down and celebrate the true meaning of the Christmas season. I’d like to share some of the resources I have used and loved. Please note that I am sharing these resources to help you and not to stress you out. Keep things simple. With the exception of the last one, these things were designed to start at the beginning of December and end on Christmas. If you can’t start December 1st, that is OK! Don’t let that stop you. Either do two lessons a day or skip a few of the lessons. I assure you the kids won’t mind. Remember the idea is to keep the focus on Christ. Don’t let it stress you out if you are “behind” or not doing it right. There is no right way to celebrate advent. 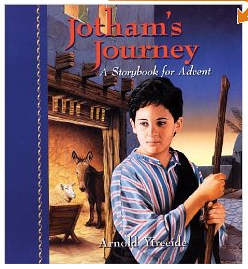 I can’t believe how captivating Jotham’s Journey: A Storybook for Advent is! It takes place in Israel just before the birth of Christ. Jotham, a ten year old boy, gets separated from his family. In his journey to find them, the kid gets hurt, kidnapped, hit, starved, rescued, fed and is in danger again. Ultimately, he stumbles on the birth of Christ. It’s pretty intense. Each chapter ends with a cliff hanger and then a paragraph or two with life application. The book is designed to read one chapter a day until you finish the book on Christmas. All of my kids have enjoyed this book, but my nine and ten year old love it. Who am I kidding? I love it. There are two other Christmas books and one for Easter in the series. I am looking forward to reading Tabitha’s Travels this year. It’s my understanding that traditionally there were Jesse Trees in most churches. It was simply a painting, stained glass window or sculpture of a tree with symbolic ornaments that represented the lineage of Christ. Many people study the Jesse Tree during advent. 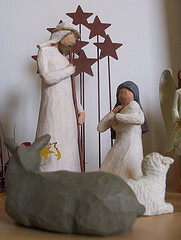 It’s really neat to start with creation and skim through the Bible finishing with the birth of Christ on Christmas Day. I love how it ties the old testament with the new testament. You see the need for a Savior with each story. There are no rules on how to set up your Jesse tree. Some add ornaments to their family Christmas tree. Some people find a barren branch and stick it in a pot of sand. Others make paper trees and tape them on the wall or window. I have even seen a tree made out of tinker toys. You can also be creative with the ornaments. You can purchase ornaments that symbolize your reading or you can make your own with felt or clay. We like to keep things simple and print free ornaments on card stock. The kids color them while I read the lesson. Our ornaments will not win a prize for their beauty but I find this is a great way to keep little kids focused on the lesson. Christmas Your Way I just discovered this one through Money Saving Mom. I love this one because it is super simple: straight forward scripture readings and coordinating ornaments. Reformed Church This plan offers the scripture readings with a short explanation and life application question. The ornament print outs are nice too. My older kids appreciate that there are some blank ornaments that they can draw on rather than color. 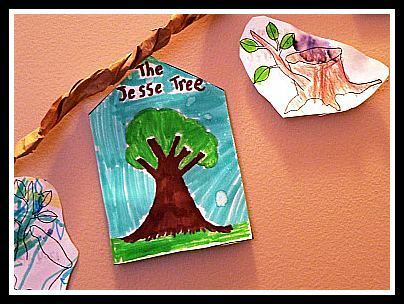 The Jesse Tree This is a children’s picture book. There are no ornaments included. We use printable ornaments from the above sources. This book is really engaging and holds my kids attention. Be aware that the story teller uses some creativity when telling the Bible stories. This is something new we are doing this year. It’s a study on the names of Jesus tied into the traditional countdown till Christmas chain. 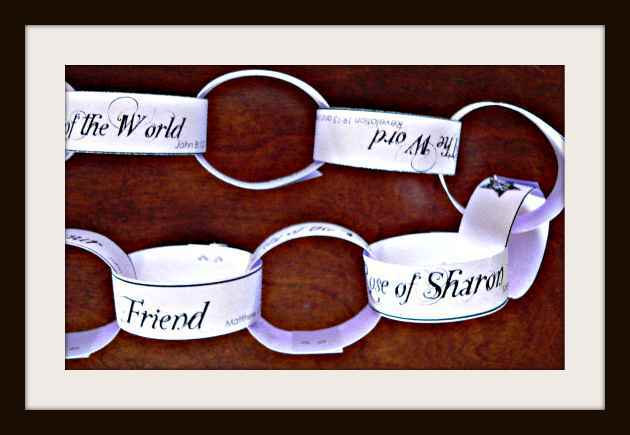 Spell Out Loud has beautiful printable links for the chain and a link to download the study. 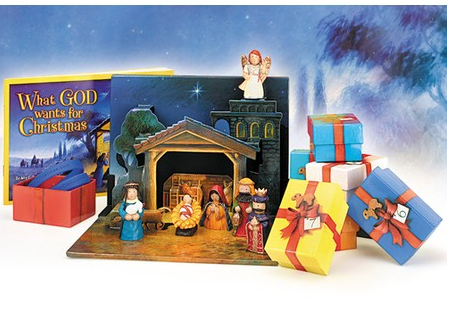 What God Wants for Christmas is a book that comes with several small gift boxes each one containing a character of the Christmas story. The book poetically tells the story of Christmas by introducing the people at the scene. With the turning of each page the child opens a box with the corresponding character. Each page ends with “what does God want for Christmas…” The last box has a mirror in it and the book explains what God wants for Christmas is you! There is a little note to parents about how to lead a child to Christ. The book might sound a little cheesy but it actually made me cry. A friend of mine was able to lead two of her children (age five and eight) in the sinner’s prayer after reading the book with them. As an added bonus, the kids love playing with the nativity set all season long. How about you? How do you keep Christ in Christmas? Every December, our church’s kid’s magazine contains an advent calendar that involves reading scriptures about Christ. This year, it follows the ABCs by coming up with a word that describes Christ for each letter of the alphabet (except x) and then reading scriptures that describe that word. Cool! Thanks for sharing Annaliese!